Hardy Farrow, a 2013 alumnus, was named to Forbes "30 Under 30" education list. For a recent alumnus, scrolling through GWork not only helped him find the perfect work study job, but eventually led him to a spot on the Forbes 30 Under 30 list. Hardy Farrow, who graduated from GW in 2013 with a bachelor’s degree in political science, was named to the education section of the list last month for his work as the founder and executive director of Let’s Innovate through Education, a nonprofit organization in Memphis, Tenn. that educates minority students on entrepreneurship. Farrow said he knew he was nominated for the award but didn’t find out he was one of the four percent of nominees that were selected until he got a text from a friend who spotted him on the list. 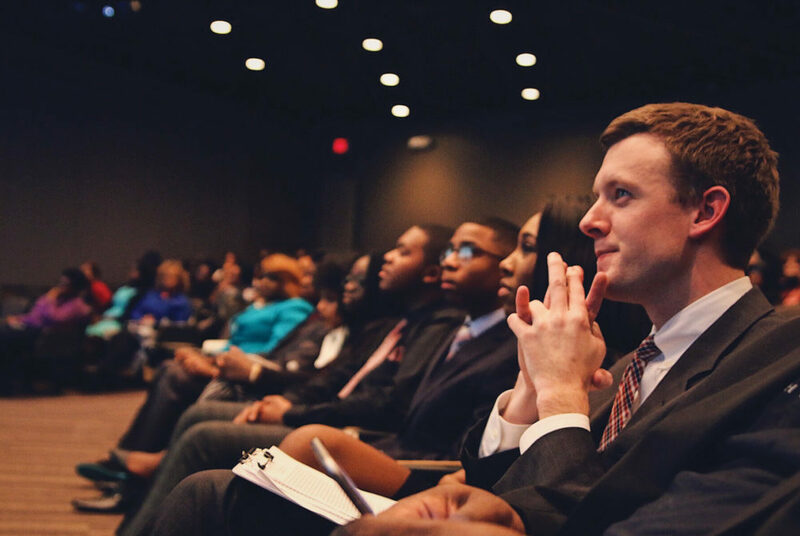 LITE’s mission is to teach minority students in Memphis to become entrepreneurs through a mentorship and education program. Students participate in workshops about business, then LITE mentors help students and give a selected group of them grant money to start their businesses. In addition to educating students through workshops, LITE also helps students find college scholarships and internships to help bridge the achievement gap between children in high- and low-income communities. “I know students who enter our program at the age of 16 or 17, and by the time they’re 25 and they leave our program, they will have the same access to internships, skills and opportunities that a kid from the highest income zip code in the city will have,” Farrow said. Kids learn best when they do something they’re passionate about and they learn the best when they actually get to try things. Farrow said his interest in education started when he searched for a work study job on GWork during his freshman year. Scouring GWork eventually lead him to a job as an intern at Teach for America and, after graduation, a job as a campus campaign coordinator for the organization. Farrow added that he considered going to law school after he graduated, but Teach for America made him recognize his privilege growing up – which allowed him to attend GW and go back to school for a graduate degree – that most students do not have. Farrow taught government and economics classes at a high school in Memphis through Teach for America. As a teacher, Farrow said he recognized students were often “restricted” from taking classes in subjects they were passionate about, like entrepreneurship. Farrow challenged his students to come up with their own business ideas using a curriculum he developed. He raised $50,000 through his personal contacts that he used as seed money to invest in his students’ businesses ideas. The original project laid the groundwork for what eventually became LITE, he said. Farrow developed LITE as a side job during his required two years of teaching for Teach for America. After continuing to a third year of teaching, Farrow managed to expand LITE to educate about 600 students throughout the city. Last year, Farrow took on LITE as a full-time job and brought on two full-time staff members. LITE’s students are averaging about $260,000 in merit scholarships, 100 percent of them have graduated high school and more than 95 percent of them are on track to graduate college within four years, according to LITE’s website. I feel very purposeful about what I’m doing and I think that’s all you can ask for in life. Although being recognized by Forbes is a noteworthy achievement for both Farrow and his organization, the founder said he is most excited to know that he has impacted students’ lives.